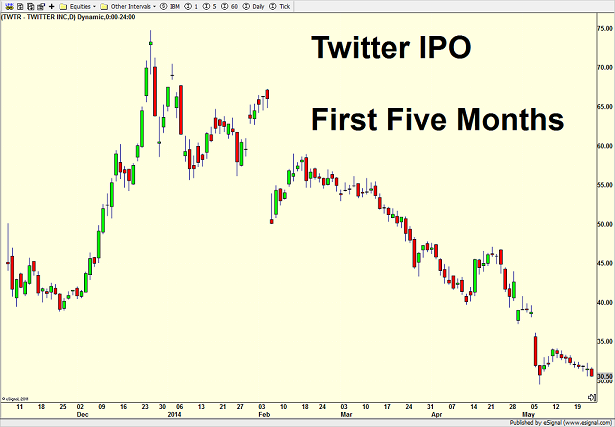 Alibaba, Twitter and Facebook Oh My! 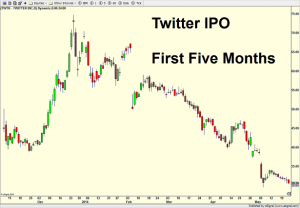 “Hot” IPOs like Alibaba, Twitter and Facebook are usually very emotional, much anticipated and huge financial media events. As I have discussed over and over, emotion in investing can have a very detrimental impact on your portfolio! 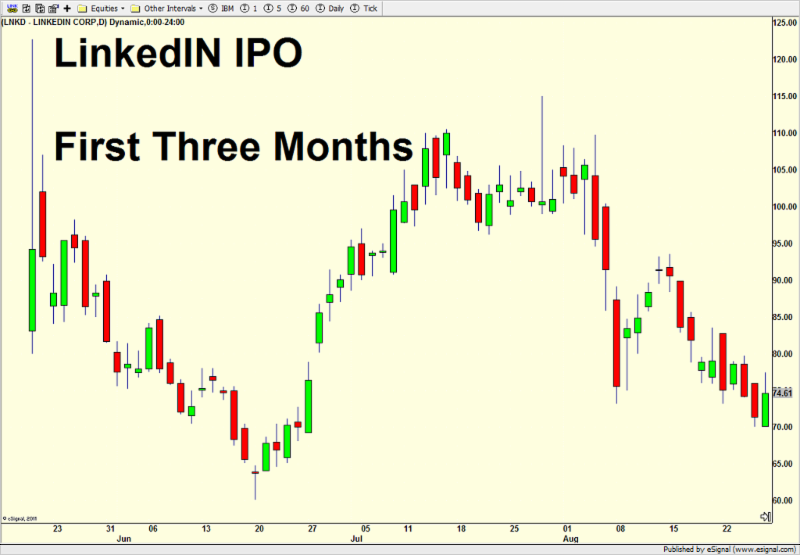 I went back and found similar, much anticipated, “hot” IPOs to show you what transpired over the coming few months. The results should not be surprising. Twitter really bucked the trend over the past few years. 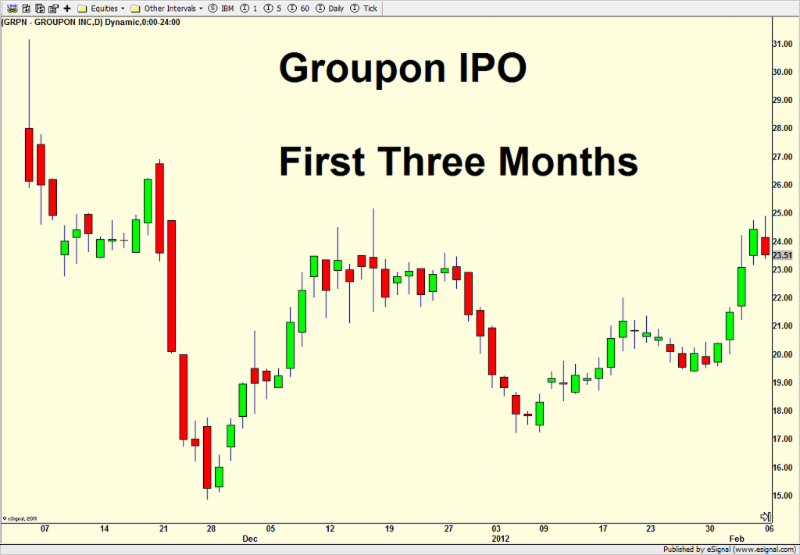 While it initially dropped 20% from its $50 first day high, that set off a very powerful rally of almost 100% to $75 before seeing the customary 60% IPO collapse to $30. End result: investors were mostly better off waiting than buying right away. 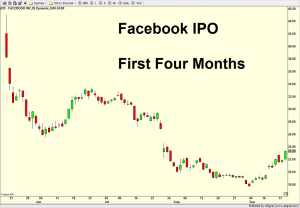 Facebook had all kinds of problems right out of the gate and you are welcome to search the archives on the blog for my very opinionated view. As you can see, it was almost straight downhill for four months before THE bottom was hit. End result: investors were absolutely better off waiting than buying right away. 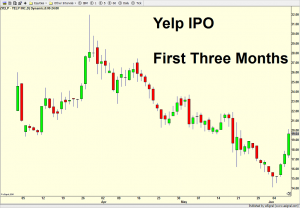 Yelp bucked the trend somewhat with only a shallow initial pullback, but the stock didn’t escape the carnage as you can over the first three months. End result: investors were better off waiting than buying right away. 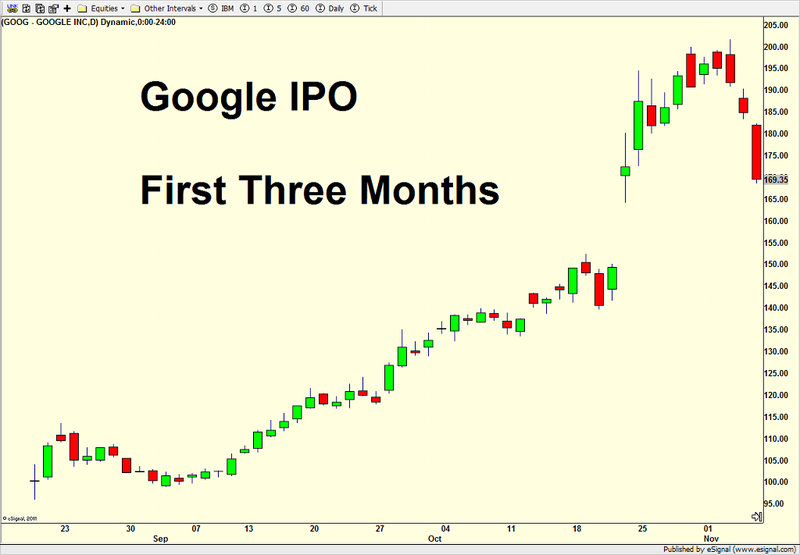 Google is below and this is certainly not a social media company like the others. But at the time, it was an incredibly hot IPO. It was also during a very different investing climate back in 2005 with vastly different results. It does not belong in the group above, but I figured I would answer the question before it was asked. End result: investors were rewarded almost immediately. 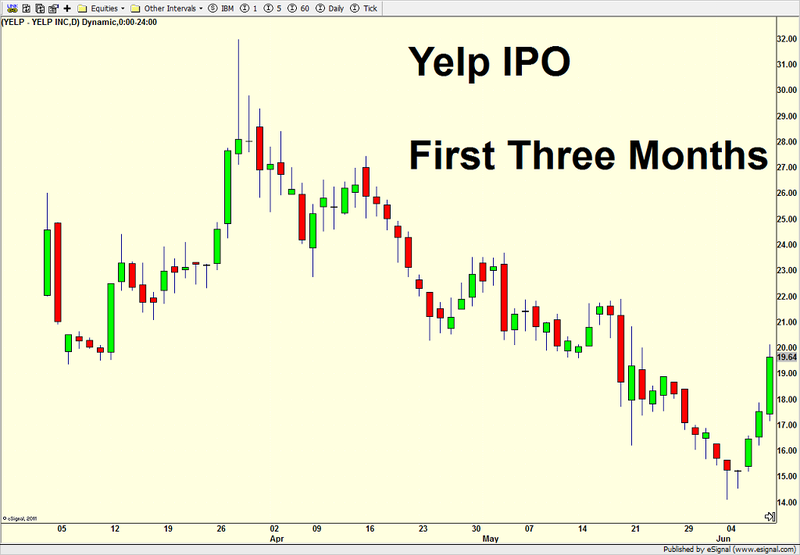 The moral of the story is that most times, investors are rewarded by having patience with hot IPOs. Personally, I would rather be late and pay up than be early and lose a lot of money. 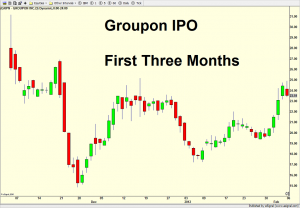 With the Fed meeting, press conference and Scotland out of the way, markets turned to Alibaba’s initial public offering (IPO) to close a very busy week last Friday. Looking at possibly a record $20+ billion IPO, the money had to come from somewhere. And judging by tech stocks behavior over the prior week or so, it certainly looked like institutional investors were paring back holdings to pay for Alibaba. 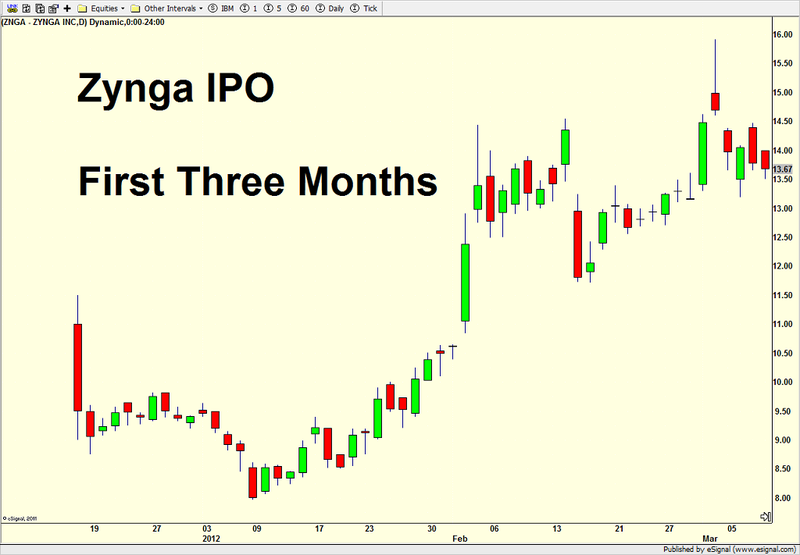 The hugely anticipated IPO priced at $68 and promptly opened at $92.70. You would think the exuberance could be felt across individual investor land, but one poll I saw showed 75% of Americans had no idea what Alibaba even was. 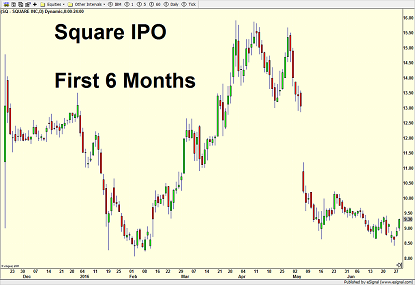 In tomorrow’s piece, I will show previous “hot” IPOs and how they fared. 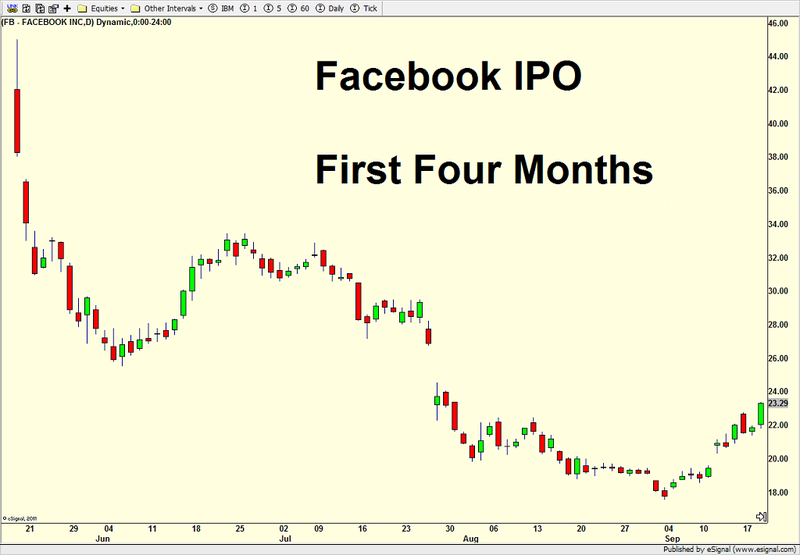 I vividly remember pundits calling Facebook and Twitter bubbles in tech, stocks and IPOs. How did those calls work out? I went out for lunch with a good friend on Friday at a local popular spot. He asked what was new in the investment world, to which I replied “Alibaba!” He said, “Ali what?” My friend said he never heard of the company nor was familiar with this hot offering. This all made me very curious, so I emailed a list of random people I know to ask what they knew about Alibaba. Only 20% knew anything about it. Not a single one knew they were going public today. No one really cared. Of course, my “research” is anything but scientific or academically meaningful, but it’s very hard for me to buy the notion of a massive bubble in stocks, tech or IPOs when the average person in my universe hasn’t a clue about what is being touted as “bubble’esque” or just like the Dotcom era. When the last tech bubble hit in 1999-2000, I couldn’t go to the gym, the golf course or even the supermarket without someone asking me about a tech stock or giving me a tip. Today and for the most part over the past few years, on a 9:1 ratio, comments from friends who are not clients fall in the disbelief camp. Most disavow the bull market and some outright hate it. More than likely the haters are also probably sitting on a lot of cash wishing they were invested. For the past three weeks I have written about the need for a short-term pullback in stocks. I have been and remain positive on the intermediate and long-term view for the stock market. Remember, pullbacks can come by stocks going sideways for a period of time or by price declining enough to entice buyers back in. In the major indices we saw a split pullback with the Dow, S&P 500 and NASDAQ 100 going sideways while the S&P 400 and Russell 2000 declines 2.65% – 3.70%. The former indices are now sitting at fresh highs and the pullback clearly ended this past Monday. Let me be clear; I remain positive over the intermediate and long-term. However, before you assume that stocks are going to rocket higher from here, which they may, there are still a few hurdles to overcome in the seasonality department. This week, the markets bullishly digested the Fed meeting, Janet Yellen’s news conference and the Scottish vote to leave the United Kingdom. 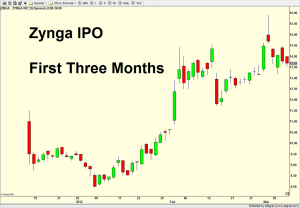 Alibaba came public on Friday with an article devoted below. 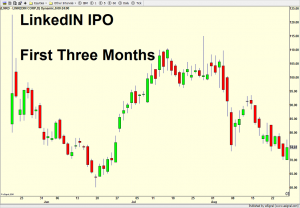 Like previous very high profile public offerings with stocks at or close to new highs, the bears came out of the woodwork last week, predicting the perfect end of the bull market on “Baba Day”. While I completely disagree with that assessment, the stock market has entered the most negative seasonal period of the year which sounds a lot worse than it actually is. From Friday’s up opening through September 30, no other calendar period is as negative historically than right now. But before you jump into that super bear camp, realize than seasonal trends or seasonality are nothing more than a headwind or tailwind. Markets do not reverse course simply because of seasonality. It just helps add a little energy. Besides the specific calendar challenges, there is also an added negative that follows the September expiration of options and futures which occurred on Friday. That trend shows a headwind most of this week, but particularly earlier in the week. Finally, with stocks rallying into the Fed statement as well as after it, there is another little trend I call the “Fed Hangover” which indicates some very short-term weakness this week. How is all this research best used? From my seat since I remain positive over the intermediate and long-term, I think it will be very instructive to see how the stock market performs through month end. If stocks can hang in and only see another mild pullback, worst case, that would reinforce the bullish case and set the stage for a run to Dow 18,000 in the fourth quarter. Almost all markets finished on a sour note last week and that spilled over to begin the new week. While I have written about stocks needing a short-term breather, I was surprised that treasury bonds could not get a lift as stocks weakened. In fact, both stocks and bonds peaked the same week, but bonds sold off more significantly, something that is unusual. The major stock market indices certainly look like they want at least a little rally, but the bigger question is will that occur right here or perhaps after the Fed concludes their two day meeting on Wednesday at 2pm. So far, the bulls are trying to mount an attack. Investors are concerned that Yellen & Co. might strike the words “considerable period” from the statement, which would be interpreted as the Fed hiking rates sooner than the 6 months initially described by Ms. Yellen’s at her first foot in mouth chat, also known as her press conference. Besides tomorrow’s FOMC announcement, the market has also been facing three distinct headwinds this week. First, on a calendar basis, this is a particularly weak time of year through the end of the month. 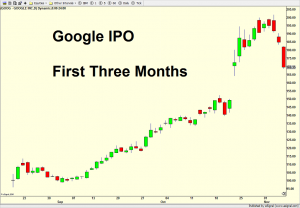 Second, market sentiment into last week had become very bullish, which can signal that investors have much of their money already in the market. Historically though, sentiment impact beyond a few weeks usually requires a catalyst to get the snowball moving downhill. 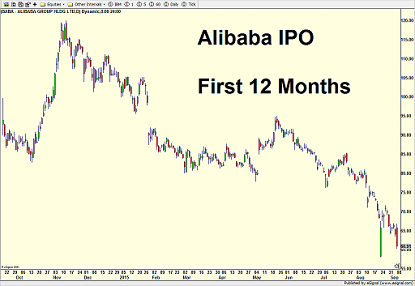 Finally, the largest initial public offering of all time, Alibaba, comes to market this week. With current pricing indications, it looks like the company will raise roughly $22-24 billion. That money has to come from somewhere and it stands to reason that it’s likely coming from funds using some spare cash and selling current tech holdings. The rest of the week is going to be action packed, but the bull market remains alive, albeit, a little wounded.